Personal care is a competitive market in India with international brands going head-to-head with locals ones. The urban, upwardly mobile youth of India are exploring new ways of expressing themselves and pay close attention to health, wellness and beauty. To win in the personal care sector, brands in India need to create aspirations that appeal to the socially saavy, world aware millennials. This report looks at the social media trends of the following 19 personal care brands for the five years between 2013 and 2017. Personal care brands need a wide reach to make sure their messages hit their target audience. Social media is being embraced by brands as the new mass media channel to advertise on, but the landscape has changed over the last five years, so where is the growth now? The chart below shows the average audience size and growth rates for each social network for the 19 personal care brands featured in this report. Personal care brands have the largest average audience on Facebook and will remain so for some time to come. Instagram has overtaken Twitter to host the second largest average audience for this set of brands. 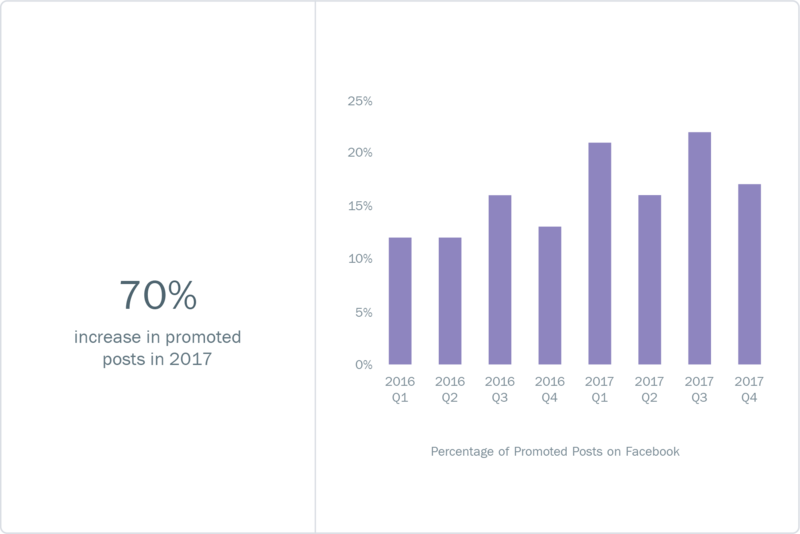 Growth continues to be strong on Instagram for personal care brands, although it’s going to take many years for audience sizes to reach Facebook levels. When is the Audience Online for Indian Personal Care Brands? A key part of any social media strategy is to publish content when your audience is online. Although promoted posts have changed the nature of this concept somewhat, it’s still important to know when your audience is online. We looked at the distribution of Twitter mentions to determine when people are most likely to be talking about your brand. For 9 hours between 9pm and 6am IST, the conversation is almost non-existent. After 6am, conversation rises till it peaks at 4 pm. Most of the conversation around personal care brands on Twitter happens in the early afternoon (12pm – 4pm) which suggests that it’s a good time for publishing content. What are Personal Care Brands Talking About on Social Media? Hair care was the biggest talking point for personal care brands, even bigger than skin care and make-up. 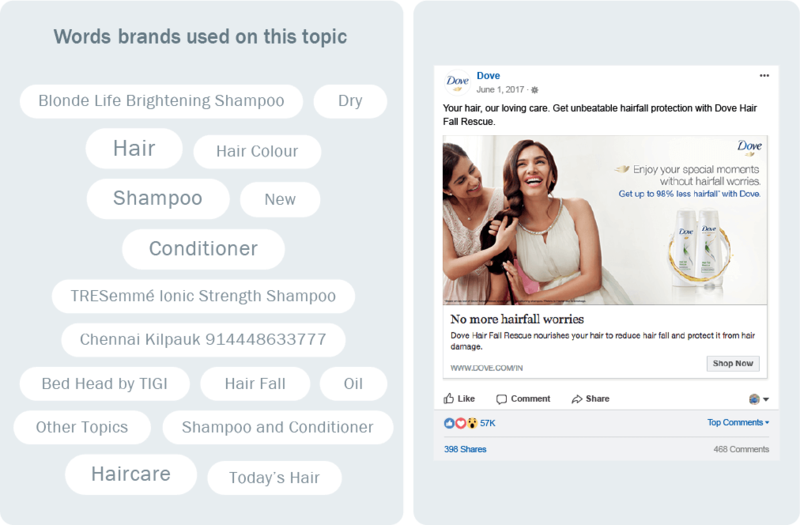 Dove managed to beat other hair care brands to have the most engaging piece of content around this topic. 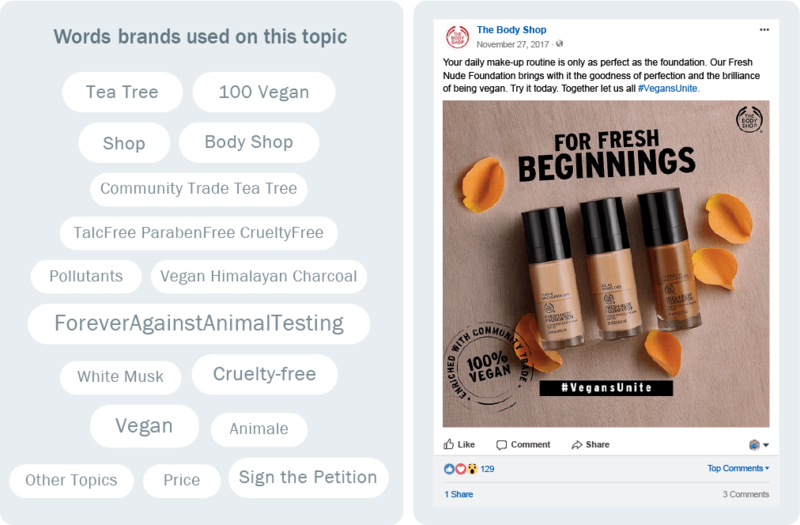 Unsurprisingly, products free from animal cruelty and natural products played a pivotal role in the content strategy of personal care brands in India. A lot of these posts were organic, like the above post from The Body Shop. Personal care brands are very keen to talk about their products more than any other topic. Other hot topics for these brands included nails, natural ingredients and promotions. Personal care brands were very vocal about product launches on social media. They also focused a lot on the advertisements for their skincare products as seen in the above post. New product launches helped increase engagement. However, it was surprising that many brands chose not to promote their Facebook posts and their campaigns failed to engage well with fans. A trend that we have been noticing across industries is a drop in branded content being published on social media. The personal care industry in India is no different. 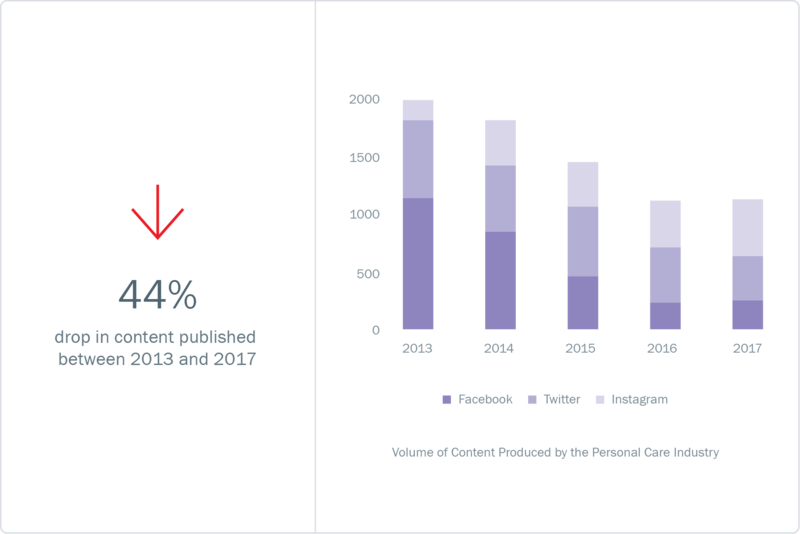 The drop is most stark on Facebook, where brands published 77% less content in 2017 compared to 2013. This could be for a variety of reasons. The lower organic reach on Facebook makes publishing too much content on this platform ineffective. 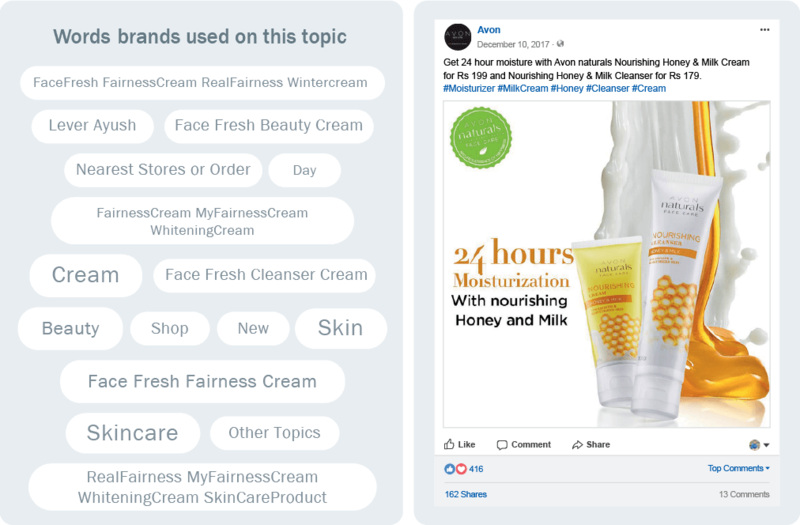 Plus, by using “Dark Posts” — posts by brands which are not shown publicly on the brand’s Facebook page — brands can target a specific audience with offers without looking promotional on their page. The amount of content published by Durex on its Facebook Page dropped by 95% between 2013 and 2017. 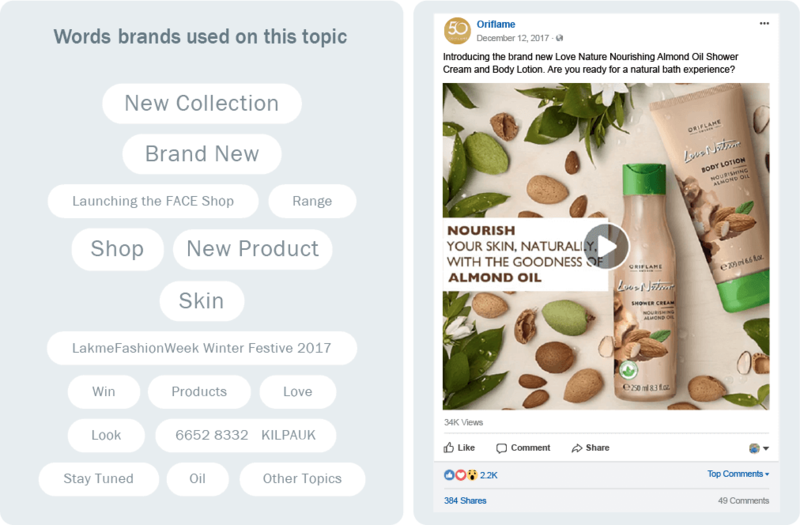 The Body Shop published three posts per day on Instagram which is three times more than what the average personal care brand published in 2017. It could be said that Instagram was built for an industry like personal care. Image is king on Instagram and personal care brands are making the most of it. However, out of the 19 brands analyzed, only 11 of them had an active presence on the social network in 2017. The nine that did not have a presence were missing out on the engagement bonanza that Instagram currently provides. Interestingly, it was found that photos, not videos, provided the best return in terms of engagement, meaning brands didn’t have to invest heavily in content creation to see good results. Personal care brands are putting two-thirds of their content efforts into photos. A fifth of their effort goes into videos. The volume of video content has doubled in 2017 from 2016, indicating that brands are taking steps to embrace this content type. 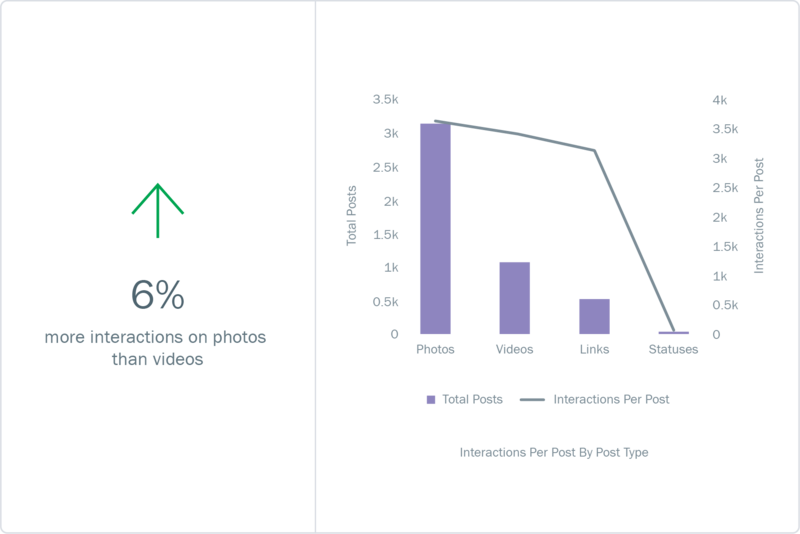 However, our analysis found that when it came to interactions per post, photos still reign supreme — but only by a slim margin. It is also interesting to note that link based content also saw a high number of interactions per post which might be an indication that brands prefer to boost their link content as it can drive revenue. To determine which social network holds the most significance for personal care brands in India, we looked at the number of interactions a post gets on each network. 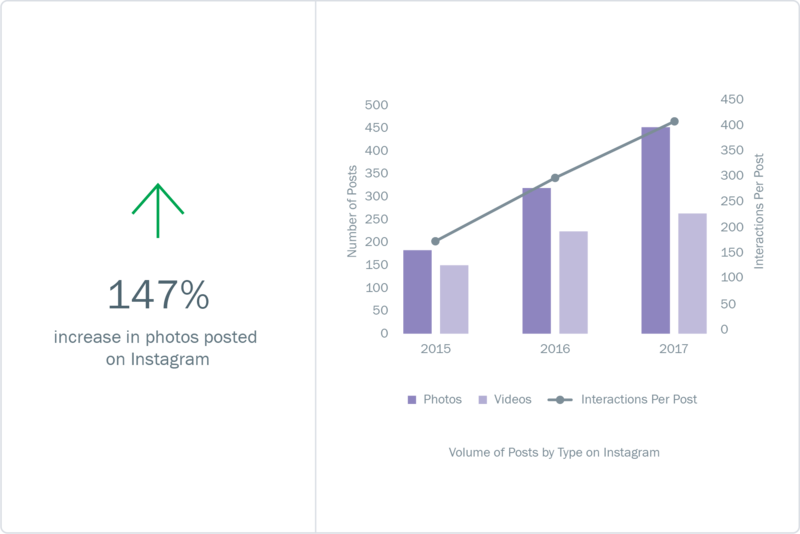 The results came as a surprise as it was assumed that Instagram would be the ideal platform for personal care brands to build a connection with their audience – particularly due to the lower organic reach that Facebook offers. 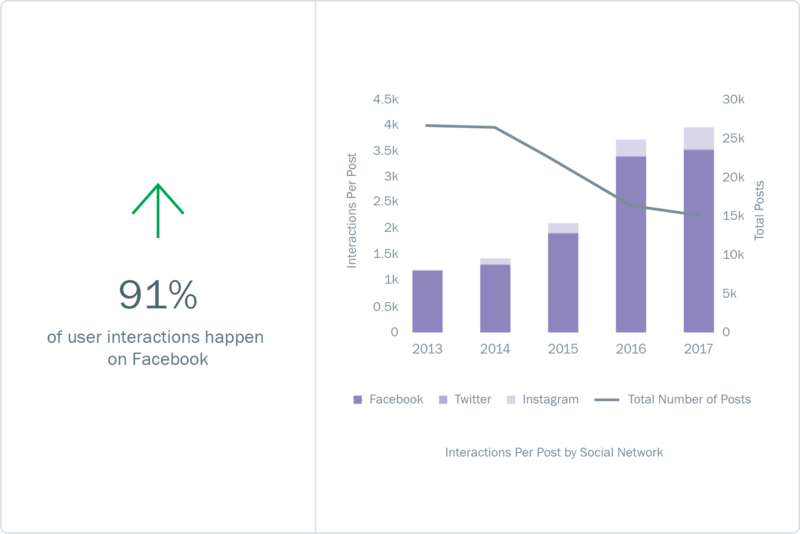 What we found was that interactions per post on all social networks were at an all time high in 2017, but Facebook is currently the social network that brands should focus on. Brands across industries have struggled with falling organic reach on their Facebook content. Some brands have opted to increase the amount of content that they publish while others have decided to put more money behind their existing content. Currently, brands are boosting one post for every four posts that they publish. This has increased from one boosted post in every six which was the case in 2016. Typically, brands see a lift of nearly 300% higher interactions on boosted content compared to organic content. 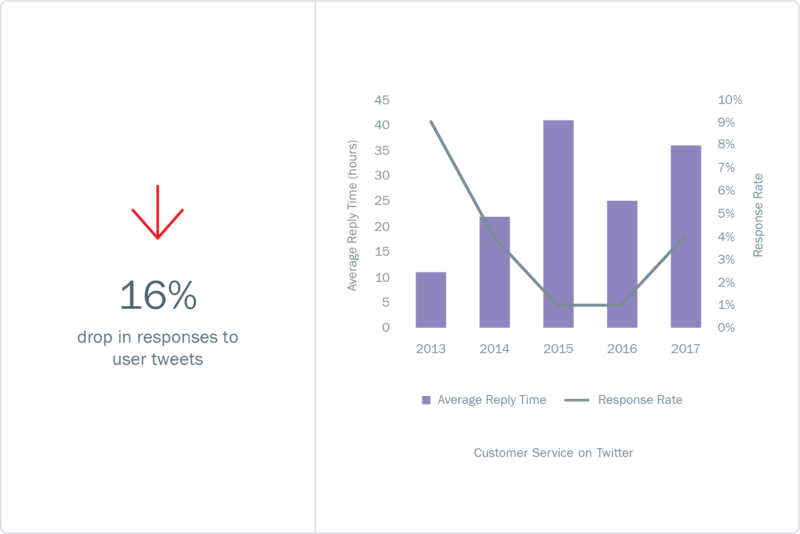 While customer service is a critical part of any personal care brand’s operation, the graph suggests that brands weren’t all that responsive on Twitter. A deeper analysis of user @-mentions of the brands revealed that most mentions were regarding contests and did not warrant a response from the company. Additionally, when we analyzed how long it takes for brands to reply to tweets, we found that most brands take a day and a half to reply. Reply times have been getting longer over the years and has tripled since 2013. Personal care brands that are concerned about new competitors to the market would do well to ensure that they provide excellent customer service in the channels that customers demand. Nivea had the most mentions on Twitter (3,444) in 2017 but only responded to 1% of them as most mentions were regarding contests. Revlon only had 507 mentions on Twitter in 2017 and responded to 7% of them. These were about products and hence warranted more responses.